Egypt has announced the recommendations of the second edition of the World Youth Forum, as well as the launch of an annual Euro-Mediterranean Youth Forum and a Euro-Mediterranean Economic Forum to be held in a different Mediterranean country each year. 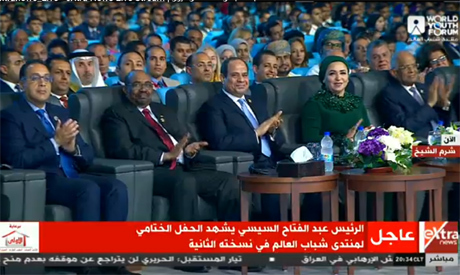 The announcement was made at the closing ceremony of the country's World Youth Forum held in South Sinai's Sharm El-Sheikh, which saw the attendance of 5,000 participants from different parts of the world. The recommendations, read out by executive director of the National Training Academy Rascha Ragheb, were announced in the attendance of Egyptian President Abdel-Fattah El-Sisi and Sudanese President Omar Al-Bashir. The forum's recommendations covered three main pillars: peace, development, and creativity. Under “peace,” the recommendations announced the launching of a Euro-Mediterranean youth forum to be held annually and hosted by each Euro-Mediterranean state, as well as holding a Euro-Mediterranean Economic Forum to discuss investment opportunities, exchange experience, and the launch of a Mediterranean union simulation model. Under the same pillar, the forum discussed water security amid climate change, the role of world leaders in building and sustaining peace, and rebuilding societies and states that have suffered conflicts. It also discussed the international community’s shared responsibility in the face of global challenges, the role of soft power in countering ideological extremism and terrorism, and Euro-Mediterranean cooperation and strategic partnership. Under the “development” pillar, the recommendations suggested promoting more volunteerism within African Countries and announced Egypt as the “capital of the African youth,”and organising a forum for entrepreneurship for African youths as part of the activities of the WYF. It also included the launch of the ‘Africa is One’ initiative, which aims to create a space to accomplish integration between countries which export raw materials and manufacturing countries on the continent. Also under the “development” pillar, the WYF saw discussions on enabling persons with disabilities, narrowing the gender gap in the labour marker. Under the “creativity” pillar, the recommendations included establishing a National Research Committee to discuss the impact of social media platforms, integrating internet security programmes into schools curriculums to protect children from cyber-bullying, establishing the National Council for Innovation and Entrepreneurship, as well as entrusting the National Training Academy with preparing and designing an integrated curriculum for creativity and entrepreneurship training. The recommendations under this pillar came following discussions on employment opportunities in the age of artificial intelligence, e-sports and videogames and how they impact the world, the role of entrepreneurs and startups in global economic growth, the role of art and cinema in shaping societies, and the role and impact of social media on its users. This year's edition of the WYF saw the Egyptian president speak about key domestic and international issues, where he answered questions on the controversial murder of outspoken and vocal Saudi journalist Jamal Khashoggi, the Grand Ethiopian Dam and relations with Ethiopia. El-Sisi vowed that Egypt would mobilise its forces to defend Gulf countries against direct threats.